Aluminum Park Bench with Back 8 Foot Aluminum with 2 3/8 Inch Galvanized Tube, In-Ground Mount, 98 lbs. This 8 foot aluminum bench features 2x10 anodized aluminum planks and a 2 3/8" O.D. galvanized steel frame and 1 1/16" cross brace and with stationary leg style to allow for permanent installation. 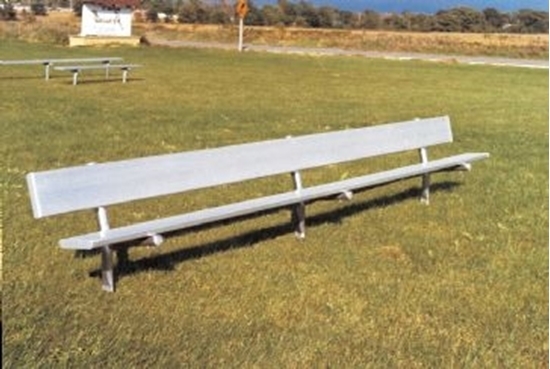 Aluminum benches are perfect for the sidelines on sporting fields for spectators or players.